The Canadian Cancer Society designates September as Childhood Cancer Awareness month, a time to educate the public about pediatric cancers. Fifty years ago, almost all children diagnosed with cancer had little hope of survival. Because of research, today about 85% of kids with the most common types of cancer will go on to lead healthy, productive lives. However, not all forms of cancer are as well understood. Research is therefore the key to discovering more about how cancer behaves and how we can help cure it. A normal cell knows how to grow and divide to make new cells, and knows when to stop and die. But a cancer cell isn’t normal. It grows and spreads quickly, and survives for a long time. Cancer cells can clump together to form a tumor. Not only can tumors grow to damage the part of the body where they start, they can also spread to other organs where they do even more damage. Children are not simply smaller adults. Some cancers almost never strike after the age of 5. Others occur most often in teenagers. 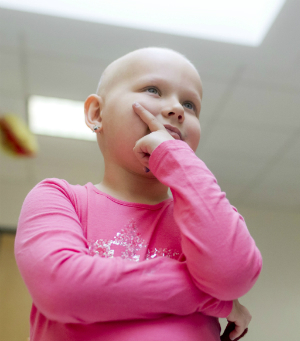 Even when kids get cancers that adults get, like lymphoma, they must be treated differently. There are also over a dozen types of childhood cancers, and countless subtypes, making it more challenging for researchers to find cures for every child. Leukemia is the most commonly diagnosed cancer in children, comprising some 30% of the total new cases diagnosed each year.